Any foodie worth their salt knows Melbourne has established a name for themselves in the culinary world. For many, it’s better known as Australia’s culinary capital – a hotbed for both five-star fine dining and back-alley street food. But with so many quality establishments to choose from, a trip Melbourne to devour its foodie scene can be overrun with options, and sometimes regret. After consulting many a Melburnian, we have complied a list of the best of the best to make planning a feast in Melbourne just that little bit easier. Blue sunshades on the deck terrace, diners perched in thatched straw chairs, a lingering scent of Aperol: Williamstown’s new beachside hero Sebastian feels like a Spanish villa on the beach in San Sebastian, the restaurant’s namesake. The beach location helps too, and with the restaurant providing panoramic ocean views of Williamstown Beach – from the deck terrace and the dining room – every seat is a good one. The glorious outside is matched by an exquisite interior, where it’s clear attention to detail was paid. Clean white walls, tables and pillars hero as the feature, alongside comfortable rounded booths in an ochre brown, bringing this upscale venue a little more down to Earth. But you don’t just come here for the views or the amazing interior design. Like most of its inspiration from the coastal towns of Spain, the food of Sebastian is world class. Spanish rice with Cloudy Bay clams and a board of preserved fish, pickles and toast are also stars of the entrée menu, and can be followed by generous plates of lamb rump with lemon, sumac and coriander or whole market fish with burnt anchovy butter. Sides include charcoal bread, fries with celery salt and coal-roasted pumpkin. The chocolate pot (with biscuits) and crema Catalana (with orange, lemon and cinnamon) promise an authentic taste of Spain, just outside of Melbourne’s CBD. Situated in the middle of Brunswick Street, the heart of Melbourne’s boho hub, Rice Queen combines incredible cocktails, Asian fusion cuisine and a solid dose of karaoke. With colourful oriental-themed interiors, you can expect hanging Chinese hand fans and dimly lit lanterns complementing traditional artwork. Paintings and signs adorn the vibrant blue walls, and cherry blossom stems emerge in hues of vibrant pink between tables. The interior design game is strong, and the same can be said about the menu. Asian fusion cuisine with an experimental twist is what this restaurant is renowned for, so it’s best to expect the unexpected. Order the Sydney rock oysters, smoked cauliflower with red miso béchamel or the pork belly bites and Korean fried chicken wings, served with basil and mint sauce. And please do yourself a favour and try the slow-cooked lamb shank, with coconut rendang curry sauce, peanuts and coriander. If you can’t make a decision based on Rice Queen’s extensive and eclectic menu (we don’t blame you), for $49 per person you can have the chef choose for you. This option includes six dishes plus sides, and is a great way to ensure you have no diner’s regret. The same goes for the cocktail menu, try them all (but not all at once!). Some notable cocktail combos include the Prince Harry (beefeater gin, ginger liqueur, lime, orgeat and orange), the Salted Caramel Old Fashioned (salted caramel bourbon, whisky barrel aged bitters) and, my favourite, the Not into Yoga, which is a favourable twist on the Pina Colada classic (Toasted coconut rum, yuzu, cinnamon, coconut cream and pineapple). As if all of this isn’t temptation enough, Rice Queen has a karaoke room concealed at the back of the establishment, which can be reserved for you and your pals as you sip on a few cocktails. Buzzing with the energy of well-fed patrons and the smell of Greek barbecued meat wafting out the door, it’s hard to walk past this Mediterranean oasis without giving in to your senses. And for good reason – this is one of Melbourne’s best restaurants. Entering Gazi, there is only one thing that can drag your attention away from the divine smell coming from the kitchen, and that is the eye-catching terracotta pots that line the restaurant ceiling. At varying heights, the orange pots, representing the ancient terracotta practices in Greece, create a wave of earthy hues above the dining area. Pendant lights hang lower than the feature ceiling, and rest over a modern dining room with polished concrete floors. The rest of the restaurant is in minimalist industrial style, allowing the food to do the talking – and boy is it chatty! The open kitchen emits the sounds of spitting meat and flaming cooktops. On the menu you’ll find a range of Hellenic street food. Large sharing meals include lamb shoulder on the bone with confit garlic, chicken off the spit with walnut dressing and fish fillets with lemon, oregano and olive oil. For smaller meals, look for the Gazi-fried quail with beetroot tzatziki or the lamb mince skewer with mint yogurt. Sides include grilled broccolini with macadamia pesto and beetroot salad with goat’s curd and honey dressing. Don’t miss the gyros’. Promise? To pair with your glorious lunch/dinner, order one of the many cocktails that Gazi offers, named after key figures in Greek mythology: the Cerberus, or the hound of Hades (Otto’s Athens Vermouth, Skinos Mastiha, lemon and orange coco ouzo); the Aphrodite, Goddess of Love (Tanqueray, Aperol, lemon, pink grapefruit, rosemary and basil) and the Eos, Goddess of the Dawn (Pinopolous, dark chocolate syrup, fresh espresso and toasted coconut). If you have any room left for dessert, you have to try the pavlova with lemon cream and thyme sorbet or the Greek doughnuts, with Nutella, honey, hazelnuts and coffee ice-cream. Found on the corner of a busy Melbourne CBD street, you’d be hard pressed to miss the giant, neon red sign of Pellegrini’s espresso bar. After acquiring Melbourne’s first espresso machine in 1954, Pellegrini’s quickly went on to cement itself as an icon, pioneering Melbourne’s coffee culture reputation. Since then, many locals will yarn that you have not visited Melbourne until you have eaten pasta at Pellegrini’s. The checkerboard floors and red vinyl bar stools hark back to its famous ’50s period, and so is the personal, charismatic service that comes with it. While there are plenty of choices on the blackboard menu, most loyal customers only see one: the classic spaghetti bolognaise. Alternatively, try the minestrone soup or a pile of glorious lasagne. All famously served with a slice of buttered bread. Gnocchi specials go down on Fridays, as well as the watermelon granita in summer. Food aside however, sit down and capture a whole lot of soul from this little, local Melbourne gem. Easey’s, named after the street it resides on and the laid-back attitude of the establishment, is the love child between a cafe and a burger bar. 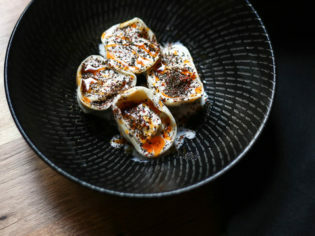 Situated on a rooftop, five storeys up and overlooking Melbourne CBD, Easey’s is comprised of outdoor dining on the roof, and indoor dining in old train carriages – also on the roof. The three carriages, giving Easey’s the nickname ‘Hitachis in the Sky’, are repurposed, steel trains from the ’70s. Dinner inside a train carriage, anyone? Sporting some serious graffiti on the outside, the owners have kept the machines mostly original, just giving the interiors a hospitality twist, throwing in some tables to host the sauce bottles and salt and pepper shakers in true American diner fashion. Easey’s serves a range of burgers, four kinds of hot dog, doughnuts with flavoured custard fillings and thickshakes of nine varieties. Sides of mac ‘n’ cheese, pizza chips, buffalo wings and chilli cheese chips make a great accompaniment to your double beef patty, barbecue, bacon cheeseburger or your mac ‘n’ cheese hotdog. You can also fit a cocktail, beer or wine in with your feed – think a Melbourne bitter, the Bloody Melbourne cocktail (jalapeño-spiked Bloody Mary with a dim sim wrapped in bacon) or the Rollercoaster (described as ‘all the alcohol we can fit in one glass’). Another Italian restaurant sporting a red giant red neon sign, Grossi Florentino offers an authentic taste of Italy in Melbourne, and is certainly an eye-catcher. From the outside the glass doors and gold-printed sign above them make the restaurant feel more like a five-star hotel. The style of Grossi Florentino’s interiors, however, is rich Italian, with mahogany wainscoting expanding half way up the walls and period paintings perched above it. Ochre retro chairs are tucked into clean white-cloth draped tables and a chandelier adorns the ceiling, covering the dining room in a yellow light that matches the gold beading and cornices throughout. Judging this book by its cover would be a great idea, with the food prepared in the kitchen being as opulent as the interiors. Risotto with spanner crab, zucchini and saffron or ravioli with egg yolk, ricotta, amaretti and balsamic are sure to satisfy your carb cravings, and the suckling pig with grappa cherry, corn and blood sausage has your protein covered. With mains such as these, it’s easy to skip the entrée, but I wouldn’t, or you’ll miss out on the tuna and buffalo yoghurt with radish, fennel and celery – which is a flavour explosion in your mouth. To finish all of this off, you need the peach with prosecco yoghurt or the lemon curd with white chocolate. And of course, as in any place of fine dining (particularly an Italian one) it would be a sin to not order a wine or two, with the waiters on standby to offer the best red or white to complement your meal. Head to Cellar Bar, downstairs, where you can grab an equally incredible feed in a more casual environment. Rice Paper Scissors is another Asian fusion restaurant – combining all the flavours, recipes and styles of the continent – that deserves a spot on this list. It also prides itself on accommodating a range of dietary requirements, and vegan dishes on the menu include smoked tofu with a green apple and roast cashew salad; pan-fried shanghai pancakes filled with taro, cabbage, ginger and chives; and crispy tofu bao. Meanwhile, meaty mains include dishes like Galloping Horses – compressed watermelon with caramelised pork, prawn, peanuts and pork crackling; the Phuket calamari – wok tossed in a salted duck egg sauce, with snake beans and Chinese celery; and duck salad – crispy roast duck with banana blossom salad, lychee and herbs. This Fitzroy venue doesn’t serve rice paper wraps, as I’d expected, but the Rice Paper Crane is not to be missed (if you are over 18). Combining St. Germain elderflower liqueur, Eristoff vodka, orange blossom, sweetened condensed milk and some cute origami, add this to your dinner order for a guaranteed fab drink. With self-proclaimed ‘hawker-style’ dining, Rice Paper Scissors has an old red-brick frontage that opens up to create ample on-street dining. Inside, the exposed brick theme flows, with a lick of white or blue paint here and there. Mounted on the wall at the bar is a vintage bike, surrounded by a wooden bar top and metal bar chairs. Industrial-style lights hang, bulb exposed, from the ceiling and into the centre of dining tables in romantic ambience. On the walls are giant black and white paintings, a specials board and an indoor plant or two. In fewer words – damn this place is cool. Run by a family of Melbourne-based Armenians, this restaurant has a focus on fine, authentic dining and good alcohol. With dark wooden floors, dimly lit by industrial lighting, the ambience in Sezar is cosy and romantic, but also reminiscent of fine dining and five-star food – meshing your cosy local with upper class cuisine. Start yourself off with some oysters accompanied by apple, anise and pink peppercorn aniseed or hummus on lavish with brown butter. Smalls mains, called michag, include cured ocean trout with fennel, apple and sumac salad, crème fraiche and salmon roe; wagyu kefta with charred cucumber, pickled onion and tomato jam; and zucchini flower with pickled beetroot, black garlic and ricotta. Large mains, like roasted green chermoula chicken with blackened onions, are not to be missed and have the potential to fill you up for the following three days. Traditional Armenian sweets on the menu include baklava with walnut toffee ice-cream and salted caramel, honey cake with quince or the chocolate ganache with spiced hazelnuts and orange blossom. Minimalist in design, but big in flavour, Mamasita was Melbourne’s first taqueria. Pendant lights, wooden tables and a bar are all there really is to mention on the design front – but the menu is a completely different story, with meals as exotic as they come. Braised ox tongue tacos and pork neck with smoked crema and almonds are two of the menu’s most eye-catching dishes – and are divine if you dare to try them. Other meals, like lamb rib chops with salsa and tortillas and kingfish collars with pistachio crema are a little less out there, but equally as satisfying. If you like, you can have corn for starter and dessert, with chargrilled corn accompanied by cheese, lime and chipotle mayonnaise and sweetcorn ice-cream both on the menu. Also, don’t look past the tequila, with plata boasting white pepper and cooked agave flavours, or the añejo with an oaky flavour and caramel notes.